Food Friday Begins Again: CSA 2013 Week 1, "Faux Frittata"
It's CSA time again, so I get to kick Food Fridays back into gear! I was thrilled last week to get the email telling me that this week would be our first pick-up for our CSA. (If you are just joining me and are unfamiliar with CSAs, check out my blog post about it from last year.) Up here in Western New York we're just barely getting gardens in the ground at this time of year, so actually getting fresh produce from the farmer feels like a special treat. a small bag of spinach. I'm a big fan of spinach. I remember when I was in second or third grade, suddenly realizing that none of my peers liked spinach and the fact that I did like it might render me permanently uncool. So I hid my love of spinach from the general public for years. I was still rendered permanently uncool just on general principle but at least spinach wasn't the culprit. As an adult, doing my own grocery shopping, I was then hindered by a husband and kids who were none too keen on it. It's only been in recent years that spinach has returned on a permanent basis to my household--I love tossing baby spinach leaves in my salads and occasionally wilting some into scrambled eggs. Asparagus and I have a much more mixed history together. As much as I loved spinach as a kid, I hated asparagus. I mean, hated it. And we had it regularly because my parents grew it. I thought it was bitter and nasty. Although I tried it once or twice again in my adulthood years only to confirm my hatred of it, I avoided asparagus quite successfully until my husband and I were at dinner at a friend's house and she made steamed asparagus and baby carrots as a side. I steeled myself to choke it down only to be polite and was quite surprised to find I actually liked it. Hers was quite sweet, even though she hadn't put anything on it. A week later I tried cooking it myself by sauteeing it with olive oil and garlic. Not bad. I have sense gotten a little more adventuresome with asparagus (roasting, grilling) and have gotten to the point of saying that, in certain preparations, I can actually like asparagus. Not all preparations--still hate it boiled--and I wouldn't say "love," but now I can deal with it with much more aplomb. Heat a medium-sized fry or saute pan on over medium heat until pan is warm; add a tablespoon or two of olive oil and let the oil heat until it shimmers. Add onion, separating the half-rings, and let it begin to cook down and caramelize, stirring occasionally. Meanwhile, prep the asparagus, put in a bowl with a tablespoon or so of water, cover with plastic, and cook for 2-3 minutes in the microwave (otherwise it'll take longer to cook than everything else in the pan). While asparagus and onion are cooking respectively, dice the roasted red bell pepper and mince the garlic cloves. When asparagus is done in the microwave and onion has begun to turn slightly brown, add asparagus to pan and saute for a minute or two. Then add red pepper and garlic. Finally, add spinach and let it wilt. Season to taste. When the spinach is wilted, add the bread crumbs and stir to combine. You may need to add a little more oil and seasoning now as the bread crumbs will soak up all the moisture in the pan. However, you don't want it soggy since you'll be adding the eggs in a minute--the oil will just help the bread crumbs and vegetables hang out together better. While the bread/vegetable mixture is cooking, whisk the eggs, egg whites, and milk together thoroughly. Feel free to add salt and pepper here too. Pour egg mixture over bread/vegetable mixture in the pan. Stir only enough to make sure the egg has saturated completely and evenly. Then cover the pan, step back and leave it alone. 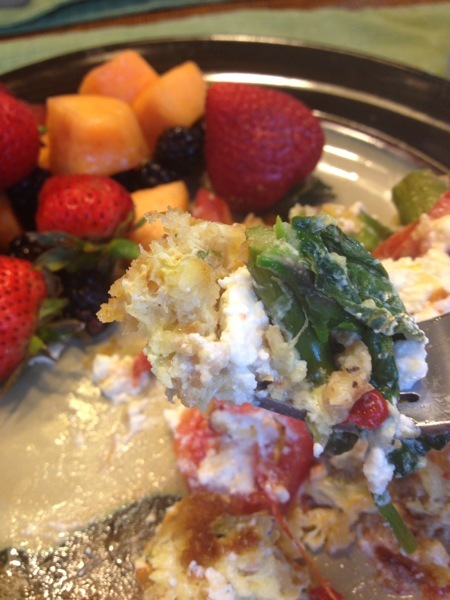 Frittatas can either be cooked completely on the stovetop or finished in the oven. I let mine cook almost completely on the stove top, then I added my tomatoes and sliced goat cheese over the top and put it covered in a 375 oven for another 5-7 minutes. I took the cover off the pan and let it bake for another 3-4 minutes. Taking it out of the oven, I let it rest for about 5 minutes before slicing and eating. For the olive oil, I used a flavored oil, "Sage and Wild Harvest Mushroom." It gives it just another layer of flavor, so I highly recommend using a flavored oil if you've got one. I also drizzled just a little "Tuscan Herb" flavored olive oil over it at the end because the bread crumbs did make it a little more dry. To be honest, I have no idea where the bread crumb concept came from. I could swear I'd seen it listed in my very brief perusal of a couple of frittata recipes before I went into the grocery store, but I never saw that listed anywhere else so who knows. (Some frittata recipes have potato in them so I'm thinking one starch is much like another in this case!) I had some leftover dinner rolls so I tossed them in my food processor to make crumbs while I was slicing my onion, and I felt all kinds of virtuous about using them up in such a creative way. The goat cheese never melted--goat cheese isn't a particularly melty cheese. And the bread crumbs made it more of a strata-like casserole and less of a frittata, I think, but boy was it tasty. And could I have crammed any more vegetables into a single meal?